Unilateral hearing loss occurs when you experience hearing loss in the ear. This may be perceived as difficulty hearing or complete deafness. Often, those with hearing loss have problems understanding speech in crowded environments, locating the source of sounds, and tuning out background noise. It is recommended to speak to a medical professional when signs of hearing loss occur. Sudden hearing loss on one or both sides is a medical emergency and requires the aid of a doctor. It is important to find out what the cause of your hearing loss is, as treatment is best implemented sooner than later. There are many causes of unilateral hearing loss that fall into one of three categories: conductive, sensorineural, and mixed. Conductive hearing loss occurs when there is a problem conducting sound waves anywhere along the route through the outer ear. 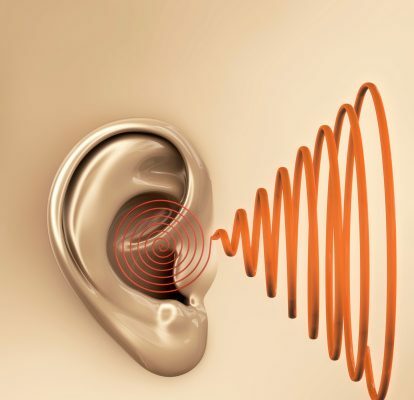 Sensorineural hearing loss is when the hair cells found in the cochlea (the sensory hearing organ) are damaged or when there is damage to the neural pathways of hearing via nerves. Mixed is when a patient displays attributes of both types. It is important to recognize that hearing loss can be a natural phenomenon of aging, and it often cannot be reversed. Instead, patients use devices that amplify surrounding noises to improve hearing. Reversible causes of unilateral hearing loss include wax buildup and ear infections. Eardrum rupture: A hole in the structure of the ear involved in conducting sound. Meniere’s disease: A disorder that affects the inner ear, eventually leading to deafness. Otitis externa (swimmer’s ear): Inflammation of the outer ear and ear canal. Shingles: An infection caused by the same virus as chicken pox. Temporal arteritis: Inflammation and damage to the blood vessel in the head and neck. Acoustic neuroma: A tumor that presses on the nerve responsible for hearing. Labyrinthitis: A disorder that results in the inner ear apparatus becoming swollen and irritated. Neurofibromatosis type 2: An inherited disease that causes noncancerous growth to appear on the auditory nerve. Otitis externa with effusion: An infection that leads to thick and sticky fluid behind the eardrum. Reye’s syndrome: A rare disorder that occurs in children and associated with aspirin use. How to diagnose unilateral hearing loss? Considering that unilateral hearing loss can be caused by many different things, it may be difficult to pinpoint the exact reason for its occurrence right away. Your doctor will take a brief history of your presenting symptoms and then perform a physical exam. They will look directly into your ears, making sure nothing is blocking the ear canals and ruling out infection. A hearing test will also be conducted with the use of tuning forks. This helps separate conductive hearing loss from sensorineural hearing loss. If the precise reasons for your hearing loss cannot be found during your visit, your doctor will likely schedule you to see an ear, nose and throat specialist. There, more advanced hearing tests will be conducted. Depending on the cause for your hearing loss, treatment will vary. For example, if there is an excessive amount of wax build-up in the ear, removing it should resolve your symptoms. If hearing loss is due to an infection, the use of antibiotics to help resolve it will help you regain your hearing over time. Certain medications may give unwanted side effects, and unilateral hearing loss is one of them. Discontinuation of these medications should help address hearing loss. Medications known to cause hearing loss include certain diuretics, chemotherapy drugs, and antibiotics such as streptomycin. You may require hearing aids if there is irreversible sensorineural hearing loss. Cochlear implants are used when there are parts of the inner ear that do not work. People use cochlear implants in the same manner as hearing aids.